National Bureau of Statistics (NBS) announced today the results of the 2014 Population and Housing Census (2014 RPL), which was conducted from 12 to 25 May of the same year. Number of people. During the 2014 RPL, the persons with habitual residence status (persons living in the Republic of Moldova for longer than 12 months, regardless of their citizenship) and persons gone from the country for longer than 12 months were covered by the census. 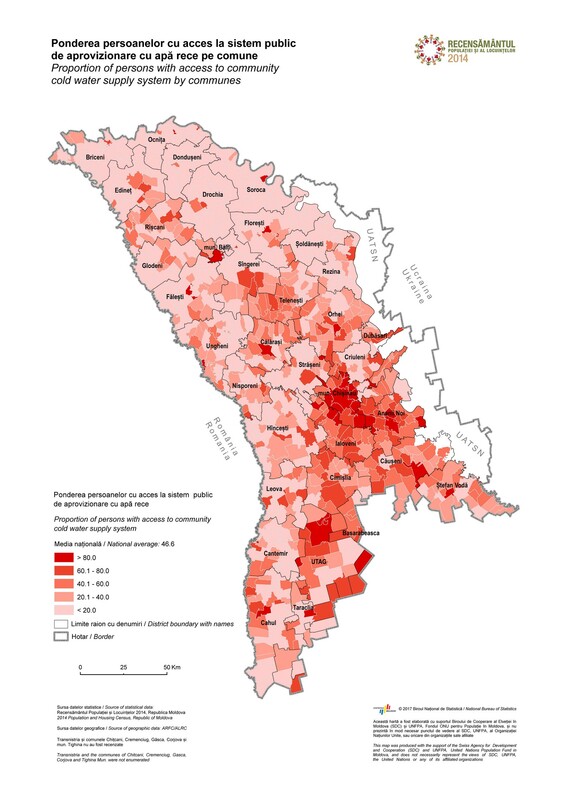 The estimates showed that as many as 2,998,235 people were covered in total by the census, of which 2,789,205 with habitual residence (those who lived prevailingly in the Republic of Moldova over the last 12 months). As many as 193,434 people were not included in the RPL. 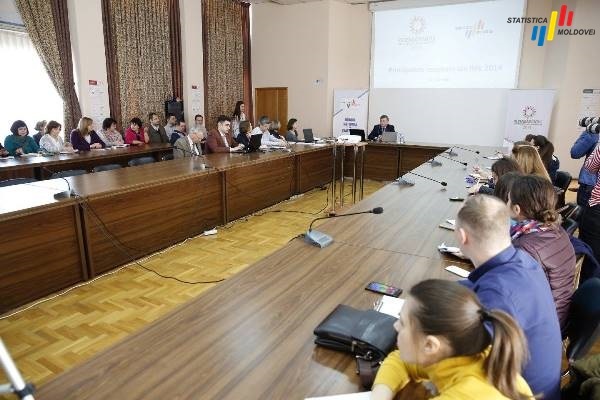 The overall coverage of the population was 91% across the country: in Chisinau municipality, 59% of the population was covered by the census, while in the rest of the country – 98.1%. According to the estimates, as many as 193,434 people were not included in the RPL. The number of population with habitual residence was estimated on the basis of the dual system estimation. 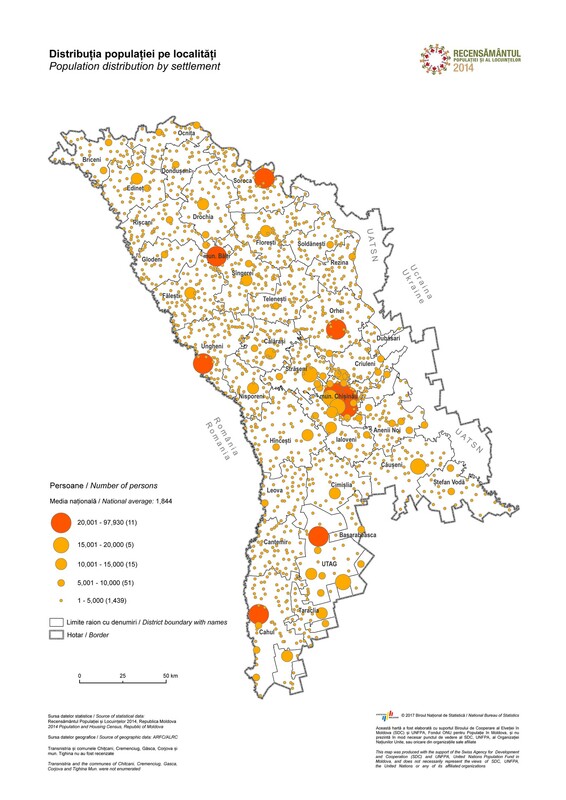 Thus, the total number of people in Moldova, covered by the census was 2,804,801 people. As many as 209 thousand of them are non-residents (people living prevailingly abroad for longer than 12 months), which is 7.5%. The number of people with habitual residents in the Republic of Moldova was 2,595,771. Population structure according to gender and age. The number of women continues to be higher. Looking back at the 2004 census, the structure by gender almost stayed the same, as 48.2% were men, while 51.8% were women. As many as 1,452,702 of the registered persons were females, exceeding the number of males by 100 thousand. Countrywide, for every 100 females there are 93 males. 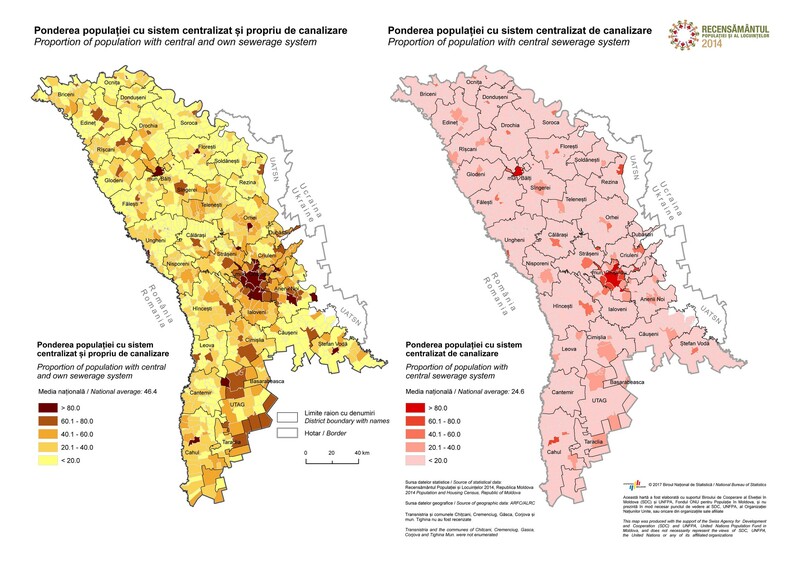 The analysis of the 0-14, 15-59 and 60+ age groups showed that the demographic population ageing is becoming more and more noticeable in Moldova. In 2014, the share of persons older than 60 was 17.4%, while in 2004, it was 14.3%. Linguistic, ethnic and religious structure of the population. The 2014 RPL collected, upon people’s will and freedom of expression, information about ethnicity, mother tongue, usually spoken language and religion. Thus, the information on the ethnicity of 2,754.7 thousand people is known (98.2% of the population covered by the census). 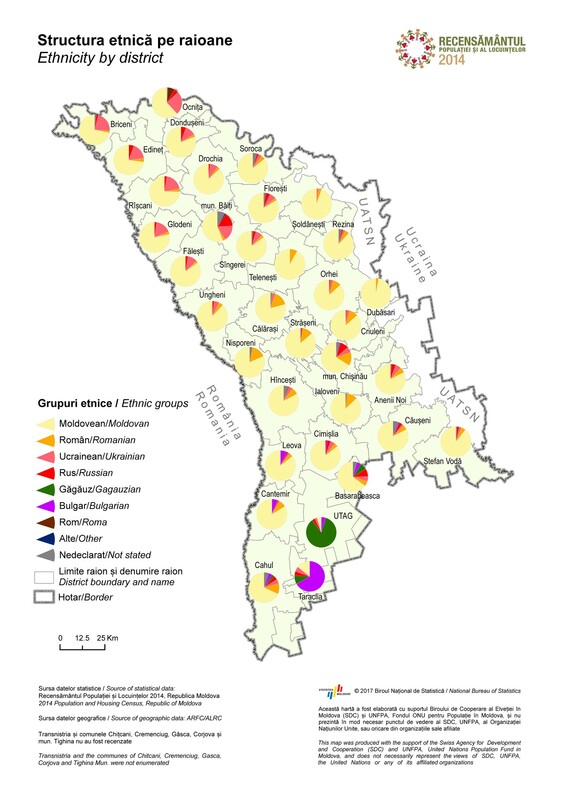 A share of 75.1% of Moldova’s population who stated what their ethnicity was, stated that they were Moldovans, 7.0% – that they were Romanians, 6.6% – Ukrainians, 4.6% – Gagauz, 4.1% – Russians, 1.9% – Bulgarians, 0.3% – Roma, while the other ethnicities represented 0.5% of the population. 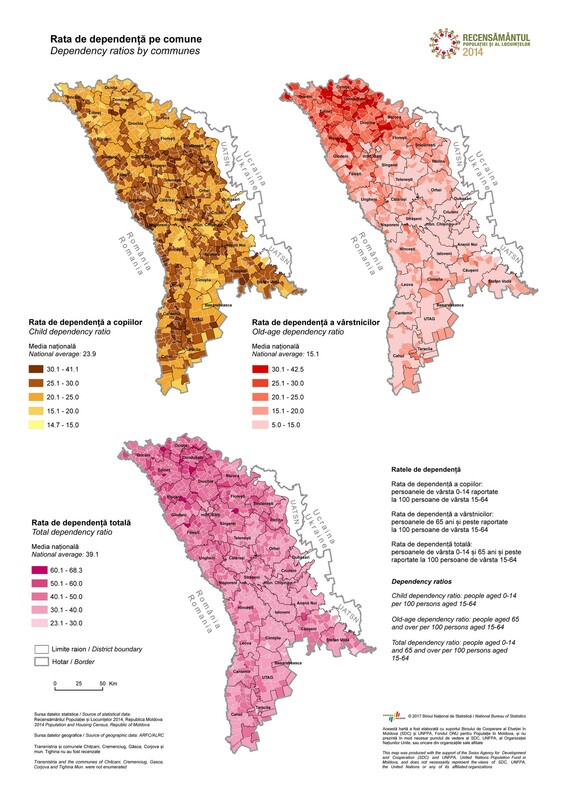 Compared with 2004, that share of people who identified themselves as Moldovans decreased by 1.0 pp (percentage point), while the share of people who called themselves Romanians increased by 4.8 pp. Over the last 10 years, the share of people of Russian and of Ukrainian ethnicities decreased by 1.9 pp and by 1.8 pp, respectively, while the share of Bulgarian, Gagauz and Roma ethnicities did not change essentially. Also, compared with 2014, the share of persons who declared that their mother tongue was Romanian increased by 6.9 pp. 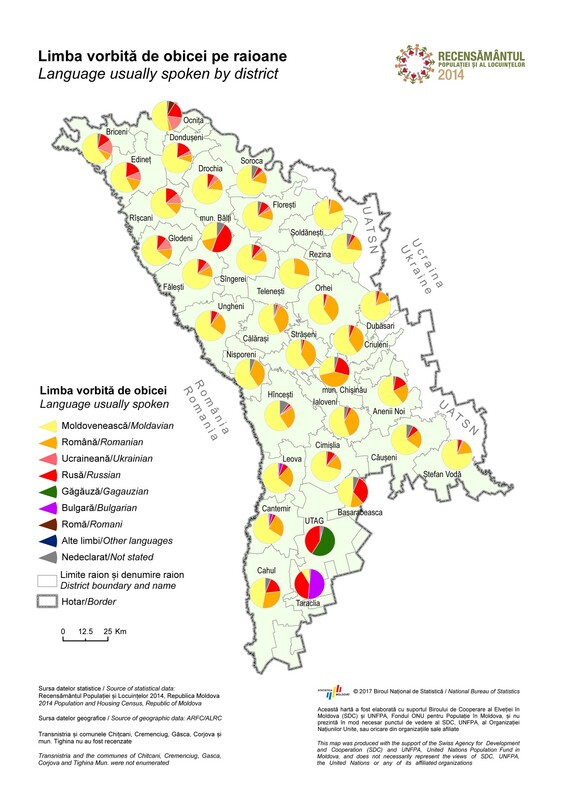 The share of persons who said that Moldovan was their mother tongue decreased by 3.5 pp. There was a decrease by 1.6 in the share of persons whose mother tongues were Russian and Ukrainian. Information about the language that the population usually speaks was collected for the first time at the 2014 RPL. 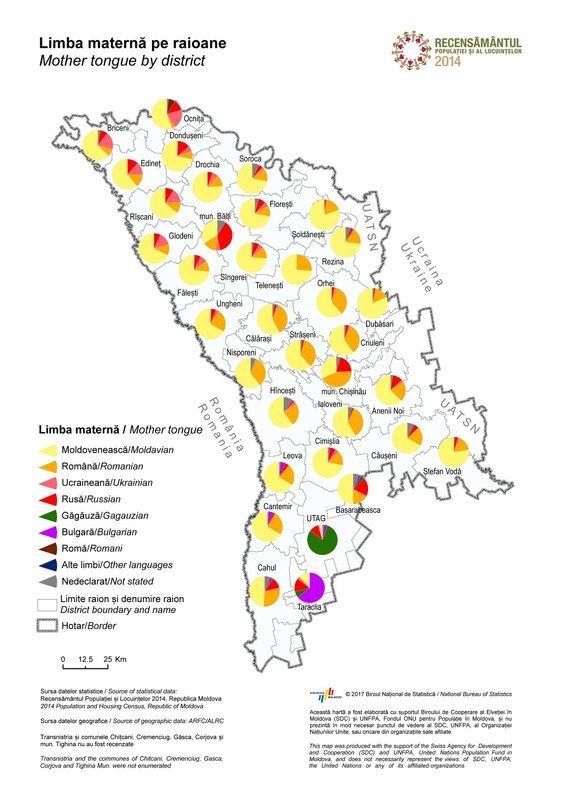 Out of the total number of people living in the country who declared what is the language that they usually speak (2,720.3 thousand), 54.6% said they usually speak Moldovan, 24.0% – Romanian, 14.5% – Russian, 2.7% – Ukrainian, which is the same for the Gagauz language, and 1.7% usually speak Bulgarian. A share of 0.5% of the population usually speaks languages other than the above-mentioned ones, while 3.0% of the population did not say what is the language that they usually speak. Religious confessions. Out of the total number of people who declared what was their religion (2,611.8 thousand), 96.8% were orthodox, by 1.3 pp more than in 2004. As for other religions, there are Baptists (Evangelical Christian Baptists) – 1.0%, Jehovah's Witnesses – 0.7%, Pentecostal Christians – 0.4%, the Seven-day Adventists – 0.3%, while the Catholics represents 1%. The share of persons who identified themselves as atheists and non-religious (agnostics) was of 0.2%, by 1.2 pp more than in 2004. As many as 193 thousand persons did not declare what was their religion, which accounted for 6.9% of country’s population. Population education level. The number of persons with a minimum education level – ‘incomplete secondary education’ represents 91.1% of persons aged 15 and above, compared with 86.6% in 2004. The number of women with higher education and vocational training exceeds that of men with the same education by 6.2 pp. The education gap between rural and urban population persists. In the urban area, persons with higher and vocational training accounted for 51.3% of the total number of persons aged 15 and above, while in the rural area 22.9% have such education level. Number and structure of households. The number of households registered in the 2014 PHC was of 959.2 thousand. The average size of a household is decreasing and was 2.9 persons, compared with 3.0 persons in 2004. Similar trends are typical of the residential environments: an urban household is made up, on average, of 2.7 persons, compared with 2.8 persons in 2004, while a rural household of average size was of 3.0 persons, compared with 3.1 persons in 2004. Living conditions. According to the 2014 RPL results, out of the 959.2 thousand registered households, 957.7 thousand (99.8%) lived in private houses, row houses or apartments. In 2014, 949.5 thousand households, i.e. 99.0% of the total number, lived in private property, while only about 7 thousand, i.e. 0.7%, lived in public (municipal) property. In the time between the two censuses, the average dwelling size for one person increased from 22.5 m2 up to 23.3 m2. 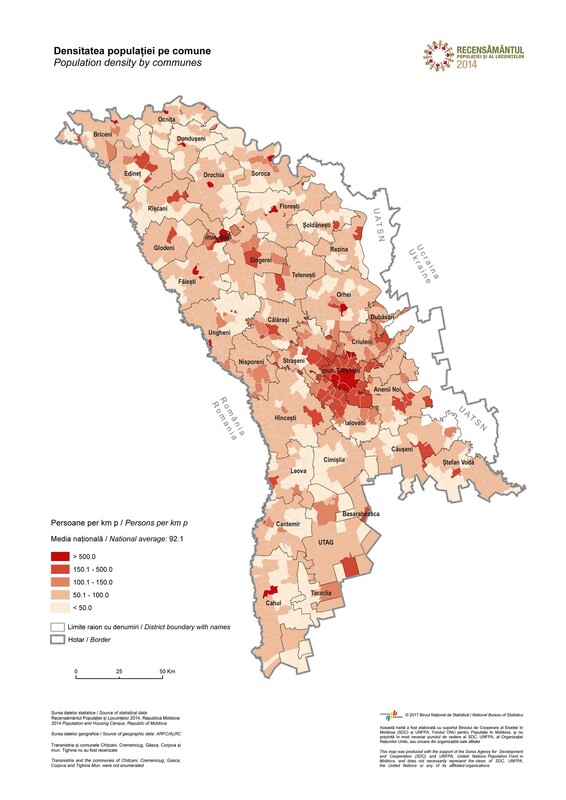 On average, one person gets one habitable room, with a slight difference of 0.1 pp between the urban and rural areas, in favour of the rural one. The PHC objective was to collect complex information to underlie the public policy in the social-and-economic area, researches for the academia and the business environment to attract investments into the country. Besides, the census will provide information to renew the sampling frame for statistical researches. ‘Policy development in education, health, social protection and in other areas must be underlain only by updated, truthful data, disaggregated per the smallest administrative territorial unit in the country according to different indicators, data that only a the census can provide every 10 years.’ said Vitalie Valcov, Director General of the National Bureau of Statistics, at the press conference. The cost of organizing the 2014 RPL was MDL 89 million. The finances for organizing and conducting the census, processing the data and publishing the results came from the state budget, as well as from Moldova’s development partners – Swiss Development and Cooperation (SDC), Government of Romania, Government of the Czech Republic, UNICEF, UNDP and the European Union, with the support of the United Nations Population Fund (UNFPA).